It’s just a few days away – the day we honor our loved ones. For some it may be a friend, for others it may be a spouse or child. Yet, the one common thread to Valentine’s Day is the celebration of love. With the clock ticking, your anxiety of what to give may rise.The key to giving isn’t in how much you spend, but in the effort/love involved. Hopefully, you’ll find something in these DIY projects that will get your creative juices flowing. Some hearts are won by both flowers and cash. This artful tutorial is at: http://origami.lovetoknow.com/origami-gifts-decorations/money-origami-rose with the image from jewerlydeals.gr8.com. Make Gingerbread Houses Without Gingerbread! 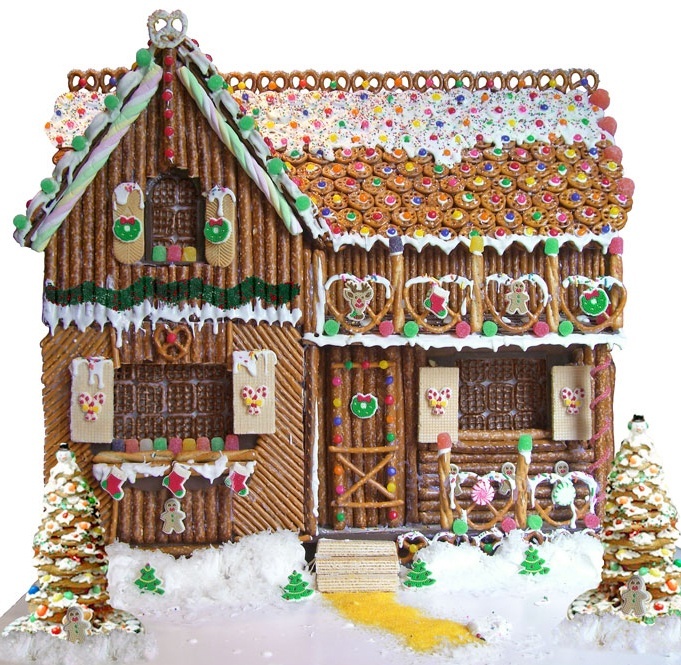 Pretzels work great for building a “gingerbread” house. Image courtesy of The Pretzel Eater’s Club. If you’re hankering to make a few gingerbread houses but don’t really want to buy the pre-fab house parts or make your own gingerbread pieces, there are so many other ways to build a “gingerbread” house. Most people agree, there are a few “rules” to making a gingerbread house or village. 1) It should be made of all edible ingredients – anything else is sorta cheating. 2) You need a great Royal Icing recipe in order to secure things quickly. There are recipes that are eggless and can still do a good job “gluing” your pieces together well. In fact, there are at least 10 different varieties of recipes that can work well as “cement.” Icings that have any fat (margarine, butter, shortening), usually will not harden enough, so they will not be appropriate. Over the years, I’ve learned a plethora of craft and food ideas for almost ever holiday. Yet, sometimes the simplest ideas are still the best. I ran across a way to make your own Easter basket with a bit of string, a balloon and a water/flour paste that gives a good visual on what it looks like to wrap the string on the balloon. But instead of using a flour paste, use Elmer’s or a non-name brand white glue. It hardens well in a shorter period of time and instead of dipping the string, take a foam paint brush and “paint” the glue over the string wrapped around the balloon. 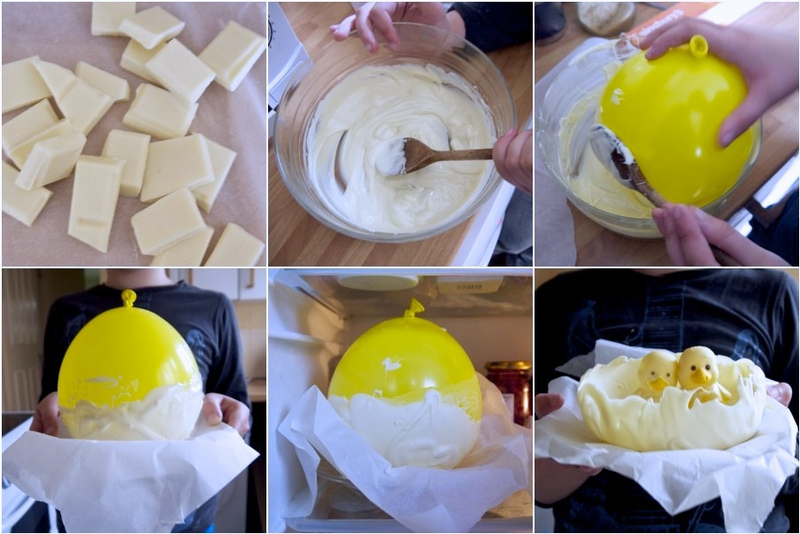 Then once everything is completely dry, pop the balloon and cut a hole where you want to add some goodies. Another way I’ve made a quick Easter egg basket is by simply melting some chocolate and drizzling layers of it over a balloon(as pictured above). I would sometimes even use multiple colors of chocolate for a different effect. Luckily, Chica and Jo have a great tutorial with images of their chocolate baskets. You’ll be surprised at how simple it is to whip up a few of these baskets. If you have any photos of your creations, I’d love to see them – and Happy Easter!